I’m posting this again, the word still needs to get out there! I’m shocked and saddened that there are still adopters out there that don’t know anything about this fund! Please tell ALL adoptors in England about this, it could be life changing for them! I see trauma everywhere in my house. I see it in a punch to the face when I’ve offered a loving touch. I see it in a no reaction when I pick up from nursery. I see it in opposition to everything. I see it in a poo left for me to find. I see it in a wary look when I say ‘I love you’. I see it in never wanting to come home. I see it in never falling asleep in the car because she’s terrified where that car might be taking her. I see it in not being able to play without controlling every aspect of that play. I see it in never being able to make a decision. I see it in eating everything on her plate all the time, just in case. I’m feeling really annoyed right now, REALLY annoyed, let me fill you in. When we first heard about the girls we were told there were no developmental or learning concerns, we met with their school and nursery and were told they were ‘an absolute pleasure’, meeting all their milestones and learning inline with average expectations. Alarm bells should have rang in my head when Big girls year 1 Teacher couldn’t quite remember who her friends were or whether she wrote with her left hand or her right hand, or ate school dinners or packed lunches, ‘she’s a happy little soul’ we were told. Baby girl and Middle girl attended a nursery together and aside from lots of wishy washy information about how lovely they were and how pretty they were, they didn’t really tell us much either. Id never spoken to a teacher before that day, in fact the last time I’d been inside a school at that point, was as a student myself. I didn’t know what to ask, or what to look out for and none of the professionals supporting us gave us any pointers either, they were all too busy telling us how great it would all be. And we believed them. We enrolled them all in school/nursery before we’d even met them, on the advice of the social workers that did know them. Apparently getting them in to a routine was paramount. No one suggested a period at home attaching to their new family, might be of benefit and I didn’t for one minute think it would be, why would I when I was surrounded by social workers that I believed to be experienced and far more knowledgeable than me about the needs of these 3 children, I hadn’t yet met. So they started school a few weeks after placement at the beginning of the school year in September with everyone else, apparently this was important to helping them feel they belonged. In hindsight, a year at home, attaching and building secure foundations would have been what would have really helped them feel like they truly belonged in this world, never mind in school. It quickly became apparent that the reading that the foster carer had said big girl had been doing every day, was a lie. Turned out big girl did ‘read’ a book every night and she ‘got’ a sticker on her reward chart for doing so, but she read alone, in her head, with no one listening to her and apparently she never really got a sticker either because they didn’t get round to buying any (hardly surprising she finds it so difficult to let people know her needs is it). Big girl had become very skilled at being invisible, that’s why her teacher had been so vague, she barely knew big girl. She started year 2 at her new school barely able to read her own name. The social worker and schools answer to this was to use a fund available for Looked After Children, aged over 5, for educational support to fund some additional tuition. So at ages 5 and 6 Big girl and Middle girl went off to a tutor for an hour a week for around 12 weeks (that’s all the fund would cover). Yes its true, I’m not making this up, and yes, I was stupid enough to believe this would be beneficial learning for them. Of course it wasn’t and had absolutely zero impact on anything other than the placing authority being able to tick a box. We plodded on. They fell more and more behind as their anxiety levels increased. It was approximately 4 years before we requested the girls adoption files from the placing authority, they didn’t make it easy for us to access files and refused to share most of them with us. We discovered, along with some more alarming stuff, that Big girl and Middle girl had been in their nursery setting when the social workers arrived and took them in to care. No one thought to mention this, or how the impact of being taken away from their family, whilst in an educational setting, might impact their ability to feel safe in similar environments in the future ie anywhere away from home. I don’t know ‘how’ baby girl was taken, how traumatic that may have been, I guess that information is within one of the withheld files, given her issues with separation anxiety, I’m guessing it wasn’t pretty. We battled on through primary schools trying to educate school staff about trauma and neglect and the lasting effects it has on children, whilst also trying to get to grips with things ourselves and navigate our way through an education system, with its confusing abbreviations that no one ever really explains to you; IEP’s, EYFS, EHCP’s, SENCO’s and SEN, with no one there to help us, or even guide us. There is no parent support school advisory service that is experienced, or even has a vague idea on the needs and rights of Adopted children. Hell, schools don’t even know this stuff. Your on ya own! Here we are, 6 years later, battered and bruised, at our wits end and forced to Home Educate 3 traumatised children. They are all academically many many years behind their peers (despite cognitive results that say they’re more than capable of average progress, in fact baby girl should have been top of her class, not years behind), all completely unable to feel safe in a school environment, and at least 2 of which appear likely to be dyslexic. Its all now left to me to close those gaps, recap the missed EYFS, provide an education and do what schools have been unable to do with their loud busy unpredictable environments, oh and with zero help. Their entire future prospects now lie in my hands! No pressure eh! Yes zero help, you did read that right! The girls are finally in a position whereby they actually CAN learn, their anxiety is at an all time low, they’re feeling safe in their environment and they’re finally learning! Our LEA have decided though that because we have ‘chosen’ to home educate, yes they feel its was completely our ‘choice’, that they are under no obligation to provide any support, not even via the EHCP that provided £1000’s of pounds worth of funding to school to support Big girls needs, or even a sniff of the £5700 (£1900 each) in pupil premium plus that schools got to support their needs, no, nothing, not a penny, no tutor, no help, no support what so ever. Because apparently ‘a school can meet their needs’. Pah! Now is it just me that thinks that if a school could meet their needs then they wouldn’t have progressively fallen so far behind academically, that mental health wouldn’t have deteriorated to the point that Big girl needed antidepressants, just to manage school!? Does that sound like ‘school can meet their needs’ to you? No, I didn’t think so. It is in fact just a pathetic excuse for the LEA to absolve themselves of any responsibility for providing my already vulnerable children with the education they deserve and so desperately need due to not having had their educational needs met in school for the last 6 years! The placing authority for not being realistic about what my girls really needed in those early days? The Local Education Authority for not providing a good enough education for my girls for the last 6 years? The local authority for not helping us now? Or me, for trusting them all? I guess the real question is which one do I take to court first! I have spent the last 6 years trying to earn the trust of my girls, we’ve engaged in services designed to encourage the relationship and promote trust. I have engaged with professionals from various departments always maintaining a very open relationship. Secrets aren’t helpful are they. Helping my girls has always been my one and only agenda. I have spent the last 6 years trusting that the professionals and support services around us were focused on supporting us to the best of their ability. I have been open, honest and trusting. I have placed my faith in the system. I made a SAR (subject access request – request for files) with the placing authorities adoption department last year. I also made one with our local authorities education department last month and the high school we withdrew big girl from last October. They made for interesting reading to say the least. Trust. Seems it is possible to be too trusting. I’m finding it increasingly more difficult to place my trust in the very ‘systems’ designed to help and support us. It seems their agenda is different to mine. Theirs involves a lot of finger pointing, back covering, box ticking and secrets it seems. How can I help my girls to invest their trust in me, in this world that we live in, how can they know who they can turn to for help, when even I am unsure of who I can trust and who I can turn to for help. 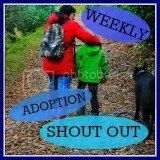 Schools & Adoption, if your involved with these, or expect to be, this is a must read! Last Wednesday over 80 Adopters, Prospective Adopters, Virtual School leaders, Social Workers and Teachers came to the Culture Space at Canada Waters library in South London. They heard presentations on ‘Why Children Placed From Care Need Support In School’ . First Adopter and Adoption UK senior manager Scott Casson- Rennie spoke of the need and then Islington Virtual School Head Hermione Michaud covered the support her Virtual School provides. The evening wound up with a Q&A that was dominated by questions on the Pupil Premium Plus.